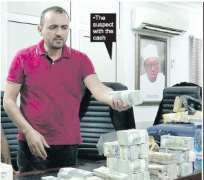 The Economic and Financial Crimes Commission penultimate Friday arrested a Lebanese, Abbas Lakis, with $2million cash at the Nnamdi Azikiwe International Airport, Abuja penultimate Friday, is being investigated for money laundering. He is suspected of money laundering. A statement by the Acting Head of Media and Publicity of EFCC, Mr. Tony Orilade, said the Lebanese was intercepted following an intelligence report that he had the cash on him. The statement said the “intelligence report indicated that the undeclared huge sums of monies were aboard the Egypt Airline bringing him from Kano Airport en route Lebanon. The statement said: “At the point of arrest, a thorough search on his luggage uncovered $2,104,936, £163, 740, and €144,680. “ Other currencies found with Lakis include Riyal 391, CHF 3,420, Lira 435, £109,000, Dirhams 10,135, ¥10,000 and Riyal10, in his possession.